A screaming baby can make you feel agitated, annoyed and frustrated. No one wants to hear a screaming baby on a plane or a bus, and you certainly do not want to listen to the screaming in your home. Babies have limited communication options, so they will use screaming or crying to get their point across. Once they realize that screaming catches your attention, they will use this communication skill as much as possible. As they grow older, the baby may scream because they want something and expect that screaming will help them to get their own way. If your baby has started screaming, talk to your partner first. You need to make sure that you have the same discipline and parenting style in place beforehand. Keep in mind that screaming should not always lead to the result that the baby wants. Once the baby is old enough to realize how to break the rules, he is also old enough to know the rules that should be followed. In the meantime, learn more about handling a screaming baby. When your baby is still little, they are probably not screaming for an ulterior motive. Instead, he or she may just like to scream. Your baby may have learned that she has a voice that can be used, and he wants to use it as much as possible. Unfortunately, some babies decide that they need to exercise their new voice as much as possible. Younger children have very little control of their impulses. In fact, the frontal lobe does not fully develop until the early 20s. At this stage, your baby lacks the impulse control necessary to stop doing things. They may scream in public places to get your attention or out of frustration. If you give your baby positive or negative attention, it teaches them that screaming will help them get their way. Whether they want a piece of candy or just want you to look at them, the baby quickly learns that screaming will help them get what they want. Every child is unique, so the same method may not work for every child. Some children may also be screaming for a reason—if your child screams when you touch a certain spot on their body, take them to the doctor to check for an injury. If they are just screaming for attention or to get their way, there are several techniques that you can use to train them out of this habit. Since every child is different, you may have to try multiple techniques from this list before you find the right one. Young children have very short attention spans. You can make use of this fact by distracting your baby with a game, treat, toy or something else to take their mind off of the tantrum that they are trying to throw. If you are in the supermarket, you could calm a meltdown by mentioning that there is a new cereal to try or ice cream. Be careful with this technique though because your baby may learn that screaming ends up getting rewarded. The hardest part of handling a screaming baby in public is the people around you. Some people think you are a terrible parent because the baby is screaming and unconsoled. Other people think you should spank the child for bad behavior. Whatever the case, you should ignore them. These bystanders want attention like your child by expressing disapproval or annoyance. Ignore them. Plus, your baby will learn if you care about them screaming in public and scream even more to get their way. Young children like routine. They like knowing what will come next and what to expect. While it is not always possible to do, try to stick to your baby’s schedule as much as possible. Run your errands at any time other than nap time or meal time unless you want a cranky, tired baby on your hands. If your child is on their best behavior, give them award for it. If you have a long shopping day ahead of you, tell them that they can go to the playground or have a treat if they are good. Or, if they sit through a church service quietly, let them have ice cream for a lunchtime dessert. Make sure that these incentives are available immediately after they have been good so that they really understand that good behavior equals rewards. 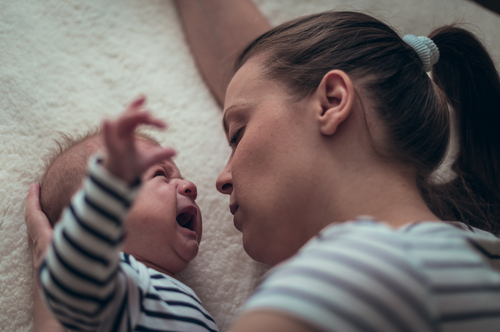 When your baby is throwing a tantrum, their emotions have completely taken over and nothing you say will register in their mind. If you are at a place—like your home—where you can just let the tantrum continue, do it. Your baby will cry out all of their feelings and then be open to talking again. Plus, this option means that you are not unintentionally rewarding bad behavior with attention. If your baby keeps screaming, don’t yell back because it will only make them scream louder. Instead, talk to your baby in an indoor voice. For your baby to hear what you are saying, he or she will have to calm down and stop screaming. Just tell your baby that you are feeling bad because of the screaming, and you would like him to use his indoor voice like you. Boredom is not easy to handle for a young child, and some babies will scream when they are bored. While you are grocery shopping, give your child a book or a toy to keep them distracted. As long as they stay busy, they will not have time for a tantrum. Plus, the right toy or book may distract them entirely from the tantrum that they were about to have. While the constant screaming may make it seem like your child is out to get you, they aren’t. It is part of being a child, and there is sometimes a reason for the screaming. Is your child tired? Hungry? Bored? Hurt? Think of the reason why she may be screaming because fixing that problem is often the best way to stop him or her from continuing to scream. Some children learn early on that a quiet place is the best place to scream if they want something. If your child is one of this kind of screamer, find some place noisy to go to. Instead of going to a quiet restaurant, go to one that is noisy and kid friendly. Some restaurants also have outdoor tables that are great for children because they can be as noisy as they want without bothering the diners inside. If you are at home, you can make screaming into a game. Scream as loud as you can and see if you can outscream your child. They will either start to compete or stop in surprise when you start screaming. Once you have this game going, switch to a game where you see who can jump the highest and farthest. Before long, you can transition to another game and put the noisier games out of your mind.